It’s a long time since I last made any concerted effort to read the Baby-sitters Club titles. I picked up Kristy’s Great Idea at a library book sale a couple of years back, and was quite disappointed upon re-reading it. And then I discovered this, the final ever book at another library book sale, and decided it would be good to see how everything concluded. Unfortunately, as a conclusion, Graduation Day is rather underwhelming. In one sense, it’s nice that the characters are still true to their beginnings. In another, however, it feels like very little has changed since the first couple of dozen books, if not since the very beginning. It really seemed like the characters were still dealing with the same-old same-old problems and emotions and, although I could see that the time machine and multiple perspectives were intended as a tribute, to me it felt a little forced and bitty. All of the old club members were there, but ones like Dawn were barely present at all. The thing that most irritated me about Graduation Day, however, were the fonts used to mimic handwriting. These were okay when they were legible, but a lot of the time, they weren’t! I didn’t read Jessi’s chapter at all, because the writing was just plain ridiculous, and had to skip a few others as well. Handwriting fonts are cute when they’re easy to read (like Dawn’s, for instance), but when they’re not, they’re frustrating and a waste of a reader’s time. 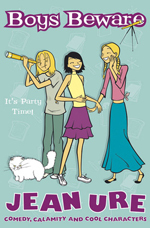 It’s sad that the Baby-sitters Club didn’t go out with greater fanfare than Graduation Day allowed. But everything has to come to an end eventually, and at least Kristy, Mary Anne, Claudia and Stacey were given a proper good-bye. I’m a fan of Cathy Cassidy’s books. She’s similar to Jacqueline Wilson in that her characters come from diverse backgrounds and often belong to non-nuclear families and families with financial difficulties. Angel Cake is no exception. Its protagonist is Anya, a young girl who has just arrived in Liverpool from Poland. Her father has brought the family to England to make a better life there, but the reality is different from Anya’s dreams and the financial climate means that their family struggles to survive in their new home. Cassidy’s choice to write about a Polish character is particularly important given current levels of ill-feeling about EU immigrants in the UK – with Polish workers seeming to cop the brunt of such sentiments. It’s great that young readers are shown Anya’s story and the difficulties experienced by immigrants in their quest to settle into a new home, because it provides an alternative to this kind of negativity. Despite her Polish background, however, Anya is very easy for the reader to identify with. She has a quiet presence in the novel, but her concerns are those of many teenagers her age – forming friendships, spending time with family and taking steps towards her first romance. I particularly enjoyed the strong relationship that Anya has with her family. She is close to her younger sister and her parents are loving and supportive. Anya’s friends are not quite as well-developed, and I found that Frankie and Kurt felt very flat to me. I was also a little disappointed that Frankie’s happily-ever-after largely involved her losing weight and changing her eating habits to match those of a boy; this wasn’t the kind of message I expected to find in a Cathy Cassidy book. Dan is more three-dimensional than Anya’s other friends, but I still felt like there was something missing. It seemed almost as though there needed to be a deeper insight into who he is. 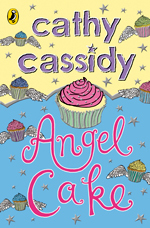 In fact, there is a level of shallowness to Angel Cake that makes me think it’s best suited to the tween market. Things are a little too simple for older teens to find the story entirely convincing. Those who belong to the right age group should love it, though, and it’s great to see an immigrant’s story being told in mainstream youth fiction. 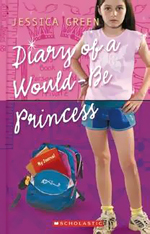 Diary of a Would-Be Princess is an enjoyable work of junior fiction with a personable and realistic protagonist. 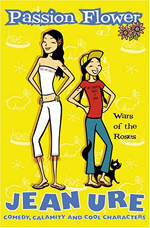 Jillian is spirited and headstrong, but she’s also extremely kind – a trait that becomes more and more apparent as the book goes on and she gathers her growing group of grade five outcasts. Her voice is very strong and is pleasantly consistent throughout the novel. The book is structured as a year-long journal that Jillian and her classmates are required to keep as an ongoing assignment in school. This allows for my favourite part of Diary of a Would-Be Princess – the short comments from Jillian’s teacher, Mrs. Bright, at the end of most weeks. These are perfectly reminiscent of the type of comments I used to receive on similar journals that I wrote back when I was in school, and offer a good additional perspective on events. The downside to the structure is that I felt like the book was one term too long. By the end, it felt a little like the same territory was being re-covered, just with a slightly different focus, and this coloured my overall opinion of the book somewhat. Nonetheless, it remains a likeable work, with a message of acceptance and friendship that is capably hidden beneath accounts of everyday life in grade five. Jillian has grown in herself by the end of the novel, but she has also helped those around her to achieve their own successes, something that sets Diary of a Would-Be Princess aside from many other books with similar themes. I picked up Escape from Year Eight when I saw it in the library because I remembered reading the second book in the series and not hating it. I also didn’t hate this book – but I’m afraid I can’t really say that I liked it either, unfortunately. I could deal with the wishy-washy plot and supporting characters, but there were a few messages here that I didn’t find appropriate for the young readers it’s aimed at. Firstly, there’s a pervasive anti-fat thread within the novel. Kaitlin’s mother used to be overweight, but now seems obsessive about staying extremely thin, to the point of not having anything remotely fattening in the house. Kaitlin herself freaks out at the idea of eating anything fattening at all, to the point of pushing aside a lunchtime cheeseburger after only a few bites. What’s more, one peripheral character, Simone, is present in the book only to be mocked for her weight and dedication to her study. There’s also ample use of terms like “spaz” (including have the love-interest do “a jerky little dance like a spastic person”) and “retard”. I’m not trying to suggest that year eight students (or eighth grade students, in this case) don’t use terms like that, but I don’t think that kind of obnoxious and insensitive behaviour needs to be presented in fiction as being normal and okay. Finally, the authors touch upon the topic of mental illness. Leon’s mother is portrayed as having ongoing issues that mean she struggles as a parent and talks to inanimate objects. She is fairly sympathetically portrayed – although this is limited by the way the kids all talk about her – and it is more the exploration of Leon’s own issues that struck me as a little naïve. We’re presented with a boy who doesn’t talk for a couple of years, who seems to have suicidal ideation, who points guns at people and who hears voices, and then we’re told that being sent to an alternative school in a big city is the only way his parents and the authorities are trying to help him. 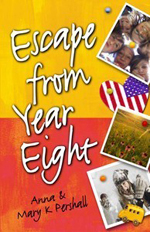 Ultimately, though, Escape from Year Eight wasn’t for me because I just couldn’t like its protagonist. Kaitlin is petty and shallow and often downright cruel. She goes along with bullying and even participates in it, without showing any real signs of learning from her mistakes. She is probably quite realistic, in this sense, but that doesn’t mean I want to read about her. So no, I didn’t hate this book, but unfortunately I didn’t really enjoy it, either. Juliet Robinson feels like the only sixth grade student at John Jay Junior High who is yet to receive a hot ticket – a card awarded for doing something judged to be cool by the anonymous ticket dispenser. Determined not to be remembered for that dubious distinction, she embarks upon a quest to discover and reveal the student (or teacher!) behind the tickets and to stop their distribution for good. 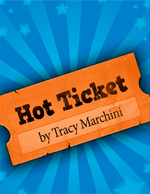 Hot Ticket is an extremely fun novel for younger readers. It’s been a while since I’ve read a book that has felt so perfectly pitched towards an audience. I would have lapped this up in upper primary school – and loved every moment of it as an adult as well. One of the things that makes Hot Ticket work so well is its great cast of characters. In Juliet, Tracy Marchini has created an entertaining, and yet realistic, protagonist. She is clumsy, overly-spontaneous and often thoughtless, but it is such fallibility that makes her so easy to identify with. She’s also creative, tenacious and quick to attempt to right any wrongs she may become aware of, and I think it would be difficult for any reader not to like her. She has an incredible energy that’s very well portrayed. The supporting characters are similarly well drawn. Lucy is the perfect foil to Juliet’s bold nature, providing a little calm where needed. She is definitely given a personality of her own, however and, although she isn’t as large on the page as her best friend is, she’s very likeable nonetheless. Crammit is great as the former victim of Juliet’s loud mouth turned friend (and possibly more). Any hint of romance is perfectly played out for the young audience of the book, which I definitely appreciated. I’m not a fan of junior fiction that shows kids acting like teenagers or adults when it comes to romance. The best thing about Hot Ticket, however, is the plot. It’s a mystery concerned with exactly the kinds of things that its audience cares about. It explores ideas of popularity and exclusion, of peer influence and self-esteem, and does it in a way that can’t help but hold the reader’s attention. There is no obvious moralising here, but there are good messages to be gleaned amongst the humour of the situations that Juliet gets herself into. Young readers will love Hot Ticket because they’ll care about its storyline and will be able to fit it into their own world. They’ll be able to understand Juliet’s frustration and anxiety because they’ll have experienced similar situations themselves. The only negative for me was the fact that there were a few grammatical errors and typos within the text. The book wasn’t full of them, by any means, but there were enough for it to be noticeable. Despite this, I would have no hesitation in recommending Hot Ticket to young readers. It’s wonderfully age-appropriate and just so much fun.